President Obama wrote an article titled, “United States Health Care Reform: Progress to Date and Next Steps,” published in the July edition of JAMA, the Journal of the American Medical Association. The article assesses ways the Affordable Care Act (ACA) has expanded and impacted health care and the health care delivery system in the United States. The article documents that since the enactment of the ACA, health care coverage has exponentially increased. With the enactment of the ACA, the uninsured rate has fallen by 43%, from 16.0% in 2010 to 9.1% in 2015. In raw numbers, uninsured individuals in the United States declined from 49 million in 2010 to 29 million in 2015, leading to the largest decline in the uninsured rate since the enactment of Medicare and Medicaid five decades ago. 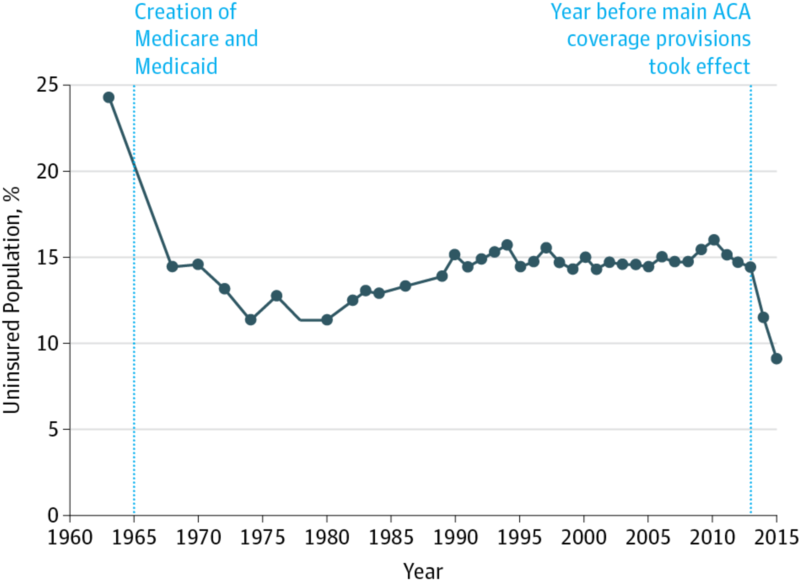 The following chart illustrates the decline in uninsured after the ACA took effect. Interestingly, in instances where states have not adopted Medicaid expansion, those states have seen a reduction in their uninsured rates, which appears to indicate that the ACA’s other reforms are contributing to increasing insurance coverage.